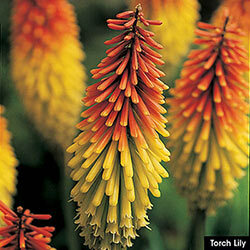 Brighten your garden, patio and arrangements with this fascinating perennial. Its bright scarlet-red and yellow, lily-like blooms really stand out. Its long narrow leaves turn into tendrils at the tips, enabling it to climb or cling to other plants or structures. Foliage Type: Ovate to lance shaped, 2 - 3" long, glossy bright green leaves form terminal tendrils at the ends. 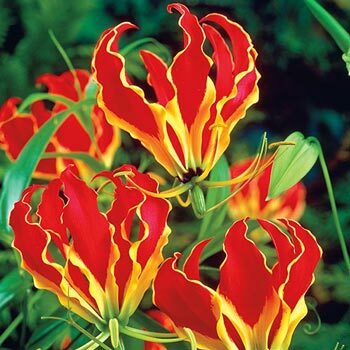 Flower Form: Lily like with reflexed curvy petals and protruding stamens. 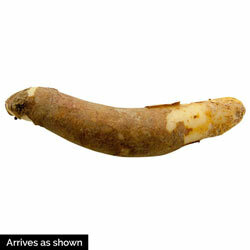 Planting Instructions: Plant tuber so top is 1-2" below the soil surface. Soil Requirements: Fertile, well drained soil. For containers, soil based potting mix with added grit. Winter Care: Lift bulbs for winter storage prior to freezing temperatures. Additional Information: Plant parts toxic if ingested.